A gorgeous Armani dress on the newly-minted Her Serene Highness Princess Charlene of Monaco. AP Photo. 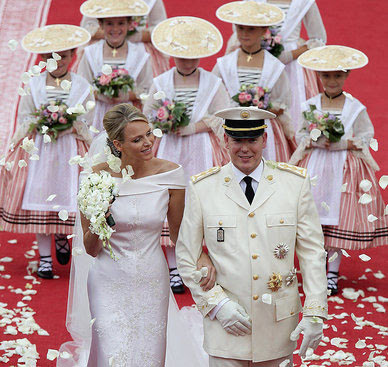 Grace Kelly’s son Prince Albert II married former Olympic swimmer Charlene Wittstock yesterday in Monaco. The bride wore Armani and looked quite nice but I am especially crazy for the dresses and hats on the bridesmaids. Aren’t they adorable—the girls and their outfits? Wonderful dresses on the little bridesmaids, accessorized to perfection! I almost posted on the wedding but I couldn't. The only title that came to my mind was "What a desaster". I don't know if you heard about the stories behind the scenes - Albert cheating on his financee, her trying to get away days befoer the wedding. It was confirmed, that she was not just nervous but unhappy. bohoooo. What a desaster! And why did she stay? The money? the title? Anyway, the bridesmaids are the best I have ever seen at a royal wedding. Though they were a bit Carpenter'ish, walking like tiny clones, faces hidden under huge hats. Well, maybe it was too much for me, having heard the sad disturbing news. Charlotte Casiraghi was also quite an appearance! Well, and now I happen to see the cover of is book at your blog! What a small world. Very different! Who are these 'lil' maids? And such a contrast with the elegance of Charlene's dress. Hi Paula, thanks for commenting and thanks for following my blog! I have to confess that I just this minute learned from my mother about Charlene's second thoughts about marrying Albert and still need to read the full story. If she was nervous about marrying him then I'm with you, what a disaster! It reminds me of Diana's alleged second thoughts about marrying Charles and her sisters telling her it was too late to back out because her face was already on the tea towels! You know, I found a picture today of Charlene crying at her wedding, just a single tear, and now I'm kind of freaking out, was that a tear of happiness or a tear of stress and misgivings! Oh no! And here I am going on about the bridesmaids' dresses. Must investigate further! As for Michael Tonello's book, I read it twice and loved it both times. I learned a lot about Hermes as a company and felt I got to know Mr. Tonello too, not only as an Hermes reseller but as a person, finding the man of his dreams, caring for his mother as she gets sick, and, in the end, being disgusted by how people who have so much in this world always want more, more, more. A terrific lesson when thinking of owning any luxury item. God knows it's nice to own nice things but I don't want it to be my whole life. This may be ironic to put these two subjects together, eh? Charlene, Albert and Monaco on one hand and Hermes on the other. Hi Terri, yes, I loved the contrast between Charlene's elegant Armani gown and the bridesmaids' dresses, which seem so old-fashioned. I was at the beach yesterday so didn't watch the wedding and know nothing about who these cute girls are. Now I am wondering if the rumors of Charlene having second thoughts about marrying Albert are true. Hi Pam, I think you're right, Kate and Charlene are great fashion role models. I feel a little frustrated with designers like Vivienne Westwood and Karl Lagerfeld suggesting, in the case of Kate, that she needed to work on her sense of style. What? Not everyone wants to dress like a wild person, or like Lady Gaga (who does what she does so well and I believe it on her). I hope designers and the fashion press will let those women alone. I think they are doing a great job so far.